The Old Testament provides a wealth of Bible truths and concepts that preschoolers can learn and understand as long as they are presented in the proper manner. As you use these lessons to teach your little learners, keep in mind that they are just guides for you to follow and not etched in stone. Each child and class is unique so feel free to modify them as needed. These lessons can be used by teachers, home educators or involved parents with equal ease. In this section, you'll find stories that introduce and reinforce concepts like how God made everyone in the whole world, or how God loves everyone and wants us to be friends and love and share with each other. Remember that while the Bible is rich with word pictures, metaphors and symbols that are familiar and dear to adult Christians, preschoolers are still very concrete thinkers and may not be able to grasp concepts that are more abstract. For instance, imagine how difficult it would be for a child to imagine a fish—even a very big fish like a whale—swallowing a person but not harming him in any way. If you will present one main idea at a time and support it with related crafts, activities, songs and fingerplays, you'll get the best results. As you work your way through the various sections of this guide, you'll see that we have provided related activities wherever possible to help you extend the lessons easily. Jesus was an actual human. He was born to an earthly mother. He lived and worked here on Earth. It is important to be careful of the verbiage one uses when discussing abstract concepts like the Holy Spirit, the Trinity, or Jesus' role as human and God. Adhering to the "Keep It Simple, Sweetie" rule of thumb reduces confusion for these youngsters. 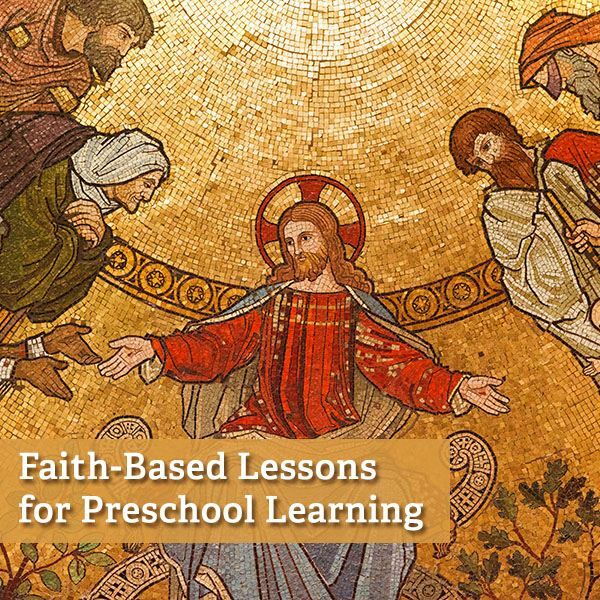 Whether you are teaching Bible lessons or secular lessons, respected experts in the field of education agree that if most or all of the child's five senses are engaged during the teaching process, a richer and deeper learning experience is provided. To help your students get the most from the lessons you present, try including some of these fun hands-on activities, many of which can be paired with the lessons presented here. Because we know that most Christian based schools and facilities are working on tight budgets, we have included some ideas and crafts that can be done with materials that you may already have on hand or you can ask the parents to donate them. These crafts require little before class prep time and the kids will love them! Our guide just wouldn't be complete without the following resources, but we had trouble trying to fit them neatly into the previous categories. Here you will find ways to transition from one center to another or how to fill in unexpected breaks in your schedule with impromptu games and activities. Because we realize that home educators and parents are just as interested in children's spiritual education and nurture, we'll include ideas on how to study the Bible effectively in your own home. Finally, because all work and no play is no fun at all, we will show you how you can celebrate a secular holiday such as Valentine's Day but still incorporate a Christian worldview. How Much Did You Like This Guide? The only way for us to improve and to provide a better reading experience for our audience is by asking for help from readers like you. Please take a minute to give us a grade and let us know how well we fulfilled your expectations (A) or if we let you down in some way (F). Of course, we hope you'll grade us on the curve and give us some grace if we neglected an area that you really needed information on or we didn't go far enough with a lesson or activity. Tell us what you need and how we can help you. While we can't teach the class or the child for you personally (although we wish we could!) we are here to support you in your teaching efforts.